No matter the kids’ age, just about every mom wonders how to organize toys. My youngest is a teenager, and I assure you I find myself wondering the same thing — only now his toys are larger and more expensive than when he was young. Oh, and since he’s a teen, he disregards my advice about putting things away as soon as he’s done using them. So a couple of times a year, when he’s tired of not being able to find anything, he asks for my help to declutter and organize his room. Teens are fun, I tell you. Not. If you’re also tired of closing your child’s bedroom door when company comes, you know the majority of the mess comes from having their toys strewn everywhere. Sure, you can help kids organize their rooms but, the instant they’re behind closed doors it looks like a hurricane hit. I’ve discovered through trial-and-error (and a lot of angst) that the trick is making storage so simple for kids to use that they don’t have to think about it at all. Unless they’re teens, then they’ll let their rooms become pigstyes until they have friends coming over. Then it’s amazing how well they remember all of your advice about cleaning and decluttering, and how quickly they can do it when they’re not complaining nonstop. Decide if it’s enjoyed, useful, or meaningful enough to keep. If not, and it’s in good condition, donate it to charity so other children can find as much joy in the toy as yours once did. If it’s not in good shape, discard it. Then it’s time to organize what’s left. Here are 6 great ideas to help. Alice at Mums Make Lists saved an enormous amount of space by removing her kids’ toys from boxes and stashing them in see-through plastic bags. Then she “filed” the bags vertically, saving even more space! Tip: Store game instructions in the bag so they don’t get lost. For puzzles, tuck a photo of the complete puzzle in the bag so kids know what the final result should look like. 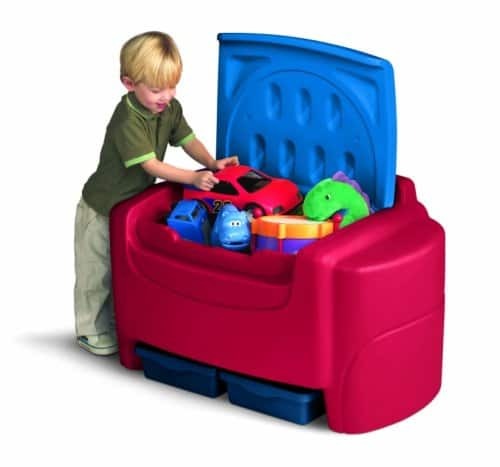 Liz at Let’s Get It Together suggests using open-bin rolling carts to hold toys. These have the added advantage of making clean-up easier, especially for young children who find drawers and knobs difficult to maneuver. Tip: Label the bins for older children, or attach photos to them for younger children, so kids know where toys should go. 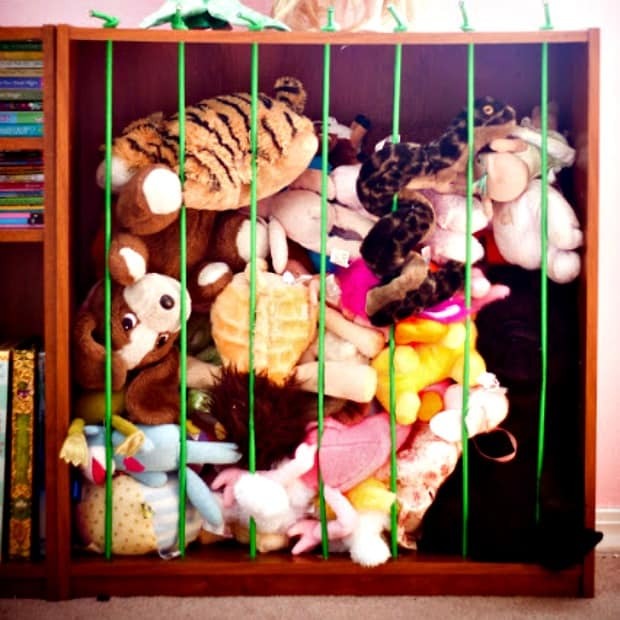 Alex Griffiths at The Giggle Garden checked out a lot of different ways to store stuffed animals, then came up with the clever solution of turning a bookshelf on its side and using bungee cords to act as “bars” of a stuffed animal zoo. Tip: This would work wonderfully to hold basketballs, footballs, and other sporting equipment, too! 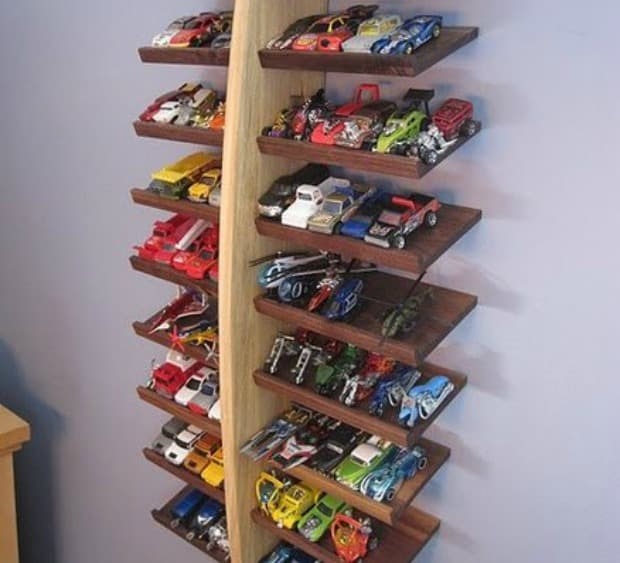 Lysdexic at LumberJocks built a clever hanging shelf system to hold his son’s Matchbox cars and other toy vehicles. By angling the shelves and adding a small lip on the front, he ensured they’d stay in place, but his son would be able to see his entire collection. Over-the-door shoe holders make great storage space for action figures, dolls, even craft supplies. Use them on the bedroom door for easily accessible storage, or behind the closet door for a less cluttered look. 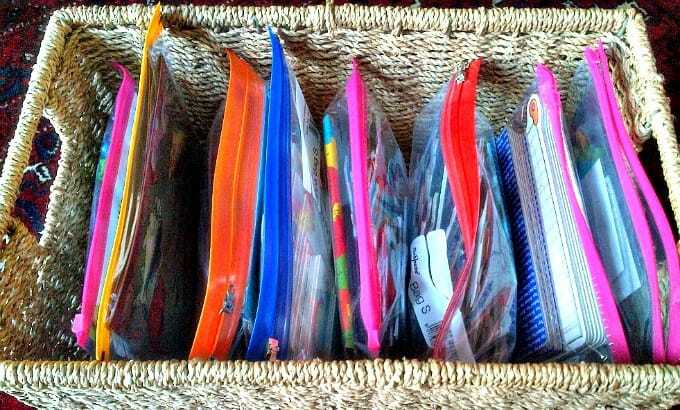 Tip: Stick with clear shoe organizers so kids can find what they’re looking for without having to pull out the contents of every pocket just to find that one toy. 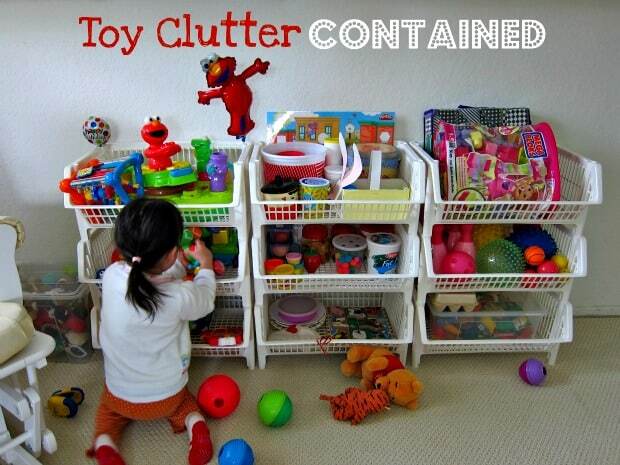 When deciding how to organize toys, remember the best solution is one that your child will use. 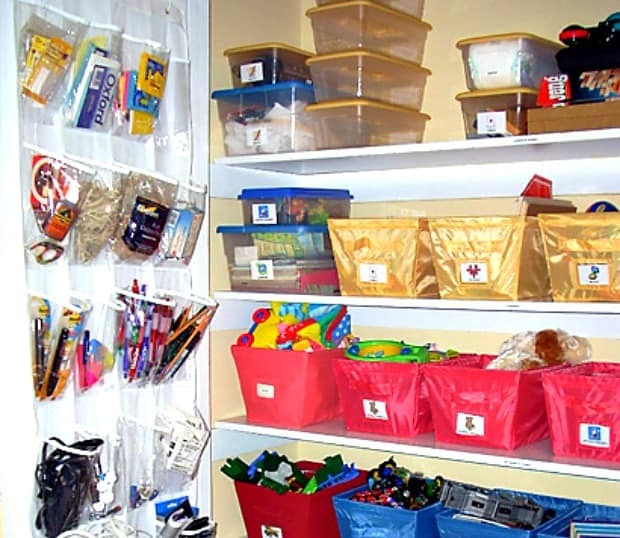 Younger children do best with simple solutions that don’t require a lot of sorting, but as they grow older their abilities will change, and your toy storage will need to as well. Want more organizing ideas? Follow my Home Organization board on Pinterest!